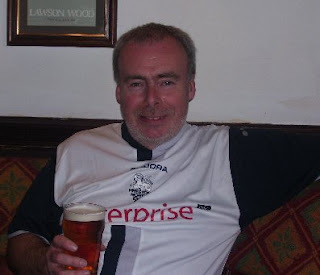 I went to Preston this weekend to see PNE vs Ipswich Town in the Championship, and also to see Brian. 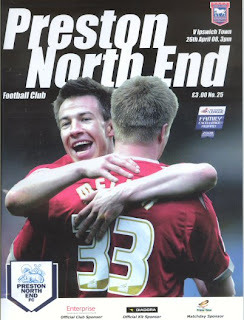 PNE are by now safe from relegation, but Ipswich had an outside chance of a play-off place if they won this match. So, not quite an end of season meaningless fixture. Brian and I were looking forward to the match. I travelled over early to Liverpool by Ryanair arriving at about 0900. Conveniently I got a bus to Liverpool's Lime Street train station straightaway for £2.50 and a train to Preston. I arrived at 1200 planning to go to Preston Harley-Davidson, but I got a text message from Brian to say he had arrived early in Preston. So I skipped the motorbikes and decided to meet Brian earlier than planned. While waiting for Brian outside the Fishergate Shopping Centre a man approached me looking for directions to PNE's ground - Deepdale. Though I knew the direction to the ground I felt that I was a bit of a phoney in the centre of Preston dressed in my PNE shirt - the guy was obviously an Ipswich Town fan. I met Brian in a Japanese Restaurant called Sakura - we had a smashing lunch, Brian's first time in a Japanese restaurant. Brian was in great form and it was good to see him again - we had not met since Uncle Charlie's funeral last September. 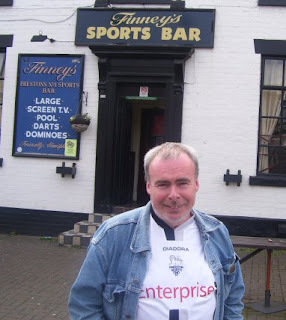 Afterwards, we walked up towards the ground stopping off for a pint at Finney's Sports Bar. This is a nice pub, named after PNE's most famous player ever - Sir Tom Finney. It is very close to the ground - my pint was a curiously honey flavoured brew. We watched part of the live Chelsea vs. Manchester United game - the whole pub cheered when United scored. Brian tells me that there is always a North/South rivalry in England. (Chelsea won 2-1 in the end). One thing the pub owners here should do is clean up the toilets - they look like they have not been cleaned since PNE last won the League title (1899). Brian took the photo to the right outside on our way to the match. We got to the ground just in time for the match. The ground was not full - 14,197 attended. The game was a real end-to-end contest with lots of chances for both teams to keep us entertained. Ipswich scored first after eleven minutes through Miller. The PNE match vs Wolves last year had only one goal for Wolves in the 11th minute, so I was hoping for a change this year. 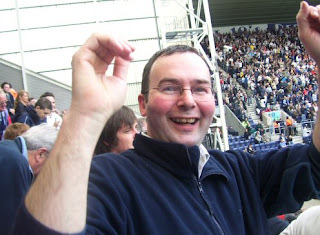 Chris Brown equalized for PNE in the 34th minute - wonderful, my first PNE goal celebration at Deepdale! We were entertained at half time by a wonderful red-coated brass band whose average age was at least 60+ years old. In the second half the excitement continued and PNE finally took the lead in the 79th minute through Neil Mellor - the photo to the left shows Brian celebrating this goal. Ipswich scored a late equaliser (Walters - 87th minute) - I think a 2-2 result was just about right. Enjoyable game - worth coming over for! After the game Brian and I had a pint (me) and a coke (Brian) in the Victoria Bar near the train station. We dissected the game, plus of course some family chat. I left Brian for the 18.50 train to Liverpool. I'll see Brian next on 20th June when Joe and I go over to Barrow for some golf. I got a taxi from the train station to the airport - my taxi driver must have been the only one in Liverpool who didn't care much for football. The flight home was delayed by 30 mins, but I got home about 11.30. A long day, but enjoyable nonetheless.